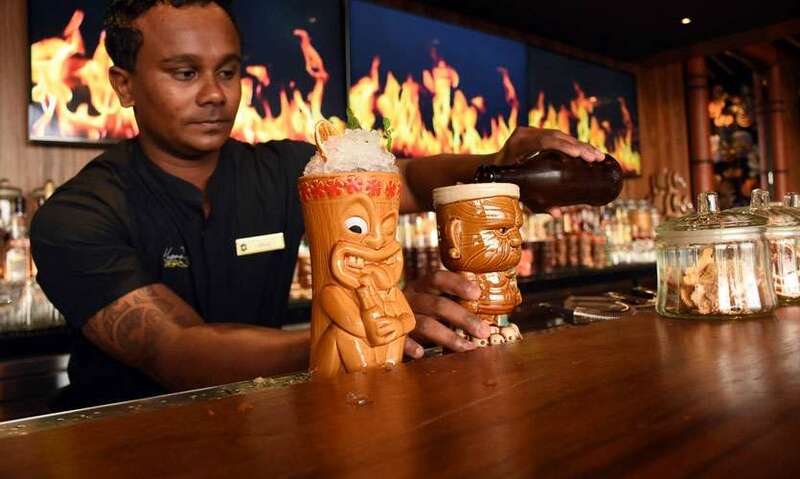 Sri Lanka’s new age restaurant and bar Kaema Sutra recently introduced their ‘Pleasure Hours’ from 5-8pm which will give diners a ‘buy one, get one free’ deal on their exotic drinks. Here’s what we thought of the deal. Kaema Sutra has a range of cocktails concocted by bartender Binoy Perera who recently walked away with the Champion title at the 26th National Bartenders Competition. The cocktails menu includes a list of creatively named drinks like ‘Moonlight Avenue’, ‘Castle of Glass’, ‘Mwaka Moon’, ‘Zombie Raksha’ and ‘Big Jet Plane’ among others. We tried their ‘Sympathy for Zombies’ (Rs. 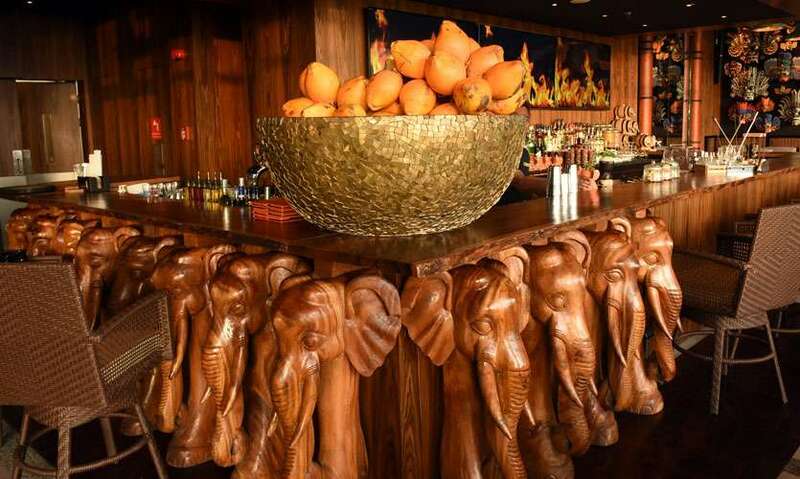 800) and ‘Walking with Elephants’ (Rs.1000) which were beautifully presented in line with the theme of the drinks. The Sympathy for Zombies is a combination of 3 types of spirit with passion fruit, coconut and apple jam while Walking with Elephants takes a twist on the classic Margarita with mango chutney, chili and fresh coriander. Their Mocktails menu include the ‘Passion Smash’ (Rs. 550) which is a citrusy mix of lime juice, green apple juice, passionfruit pulp and ginger beer and their ‘Mango with Attitude’ which was a personal favourite that was made with mango, chili, lime and ginger beer. No pleasure hour is complete without food and Kaema Sutra has got it covered with their range of bites. The menu includes dishes like ‘Hot Chili Wedges’, ‘Galle Face Green Isso’, ‘Idly Slider’, ‘Manioc Floss’ and ‘Spicy Quail Eggs’ among others. We tried their Porkscicle Roti Roll (Rs.1200) which is a slow cooked curried pork rib wrapped in Gothamba roti. A savoury popsicle was a novel idea that we loved and the soft, juicy curried meat combined with the chewy texture of the roti made it a perfect snack. 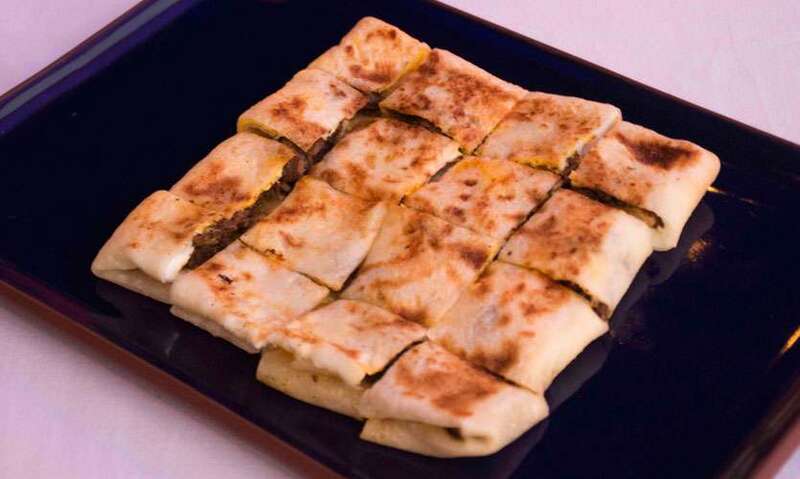 Their Egg Roti Squares (Rs. 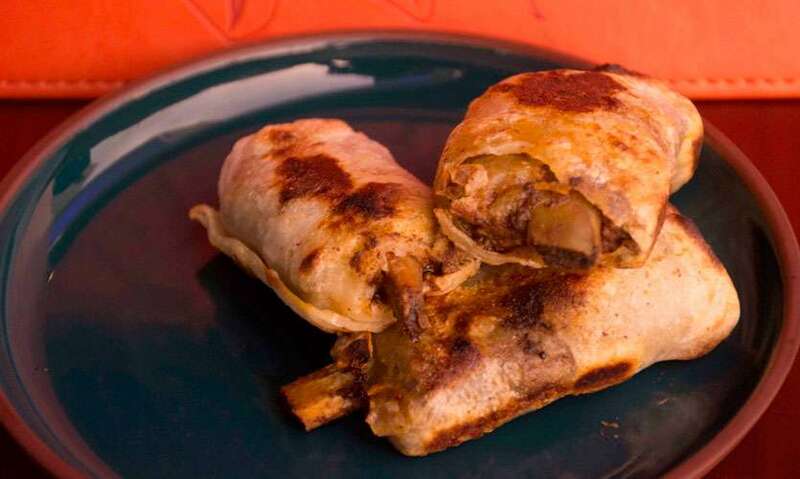 800) is a street food favourite with roti stuffed with mutton or pollos and served cut into small squares. 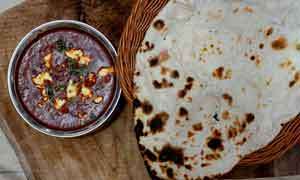 We tried the mutton roti squares which uses Australian mutton curried and slow cooked for over 2 hours. The bite sized squares make it a perfect dish to share but we bet that you wouldn’t want to once you taste it! The other dish is the Black Hopper (Rs. 500) which is a dish that is unique to Kaema Sutra. 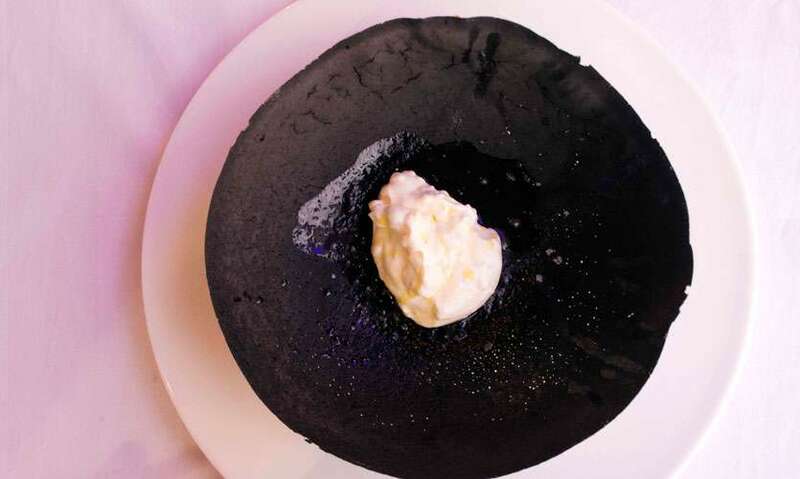 A 9-inch black hopper made from fresh squid ink served with buffalo curd sounds like a simple dish but the flavours are anything but! Simply break the edges of the hopper and dip it into the curd that is mixed with homebased salt and scoop it up and be amazed at the simple flavours the dish evokes. 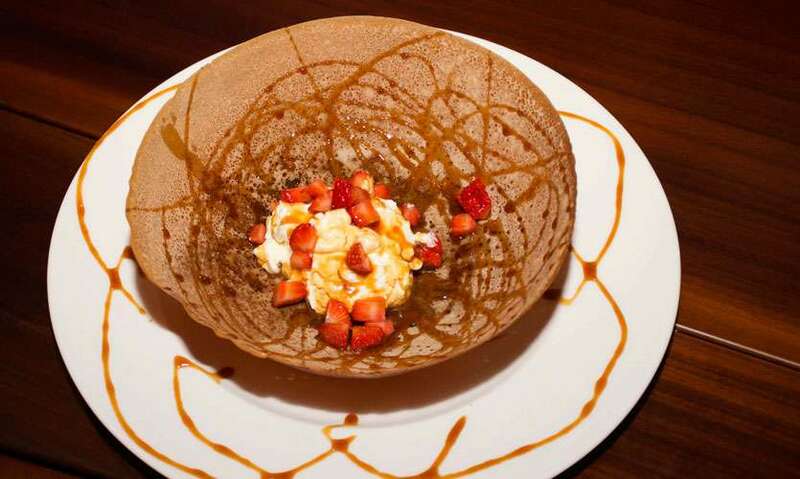 If you are looking for something sweeter you can try their What the Hopper (Rs. 600) which is a honey hopper filled with whipped curd and fresh strawberries in the center and topped off with palm treacle. We also tried out their Tuna and Egg Cutlet (Rs.800). Having wowed Colombo when it was first introduced, the Tuna Cutlet at Kaema Sutra is a twist on the Sri Lankan egg cutlet. An out of the box thinker as always, Chef Dharshan replaced the half-boiled egg that is usually used in a cutlet to a full boiled egg and completely changed the game on the common egg cutlet. This Tuna Cutlet is the size of a cricket ball filled with a soft scotch egg and sashimi grade tuna made in an ambul thiyal curry. 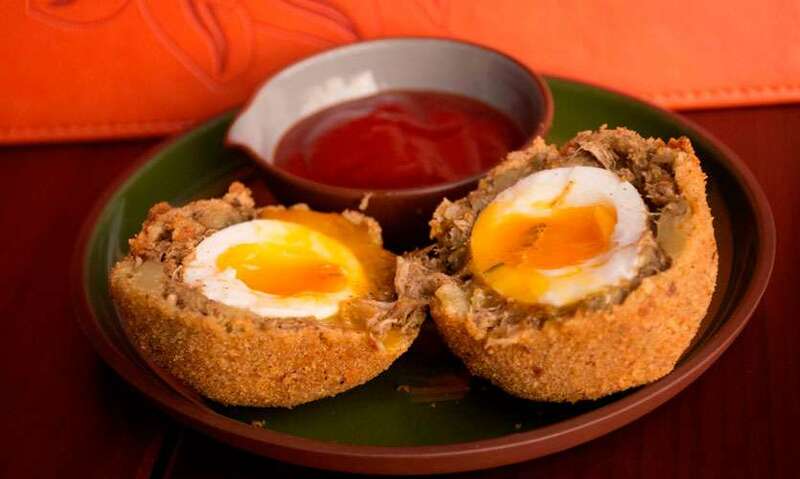 Served straight from the frying pan, the wow factor of the dish is when the knife slices the cutlet into two and the egg yolk oozes from the cutlet to the plate. Their Lamprais (Rs.1,200) is probably the most expensive lamprais you will eat but this is because each lamprais is wrapped and baked to order. 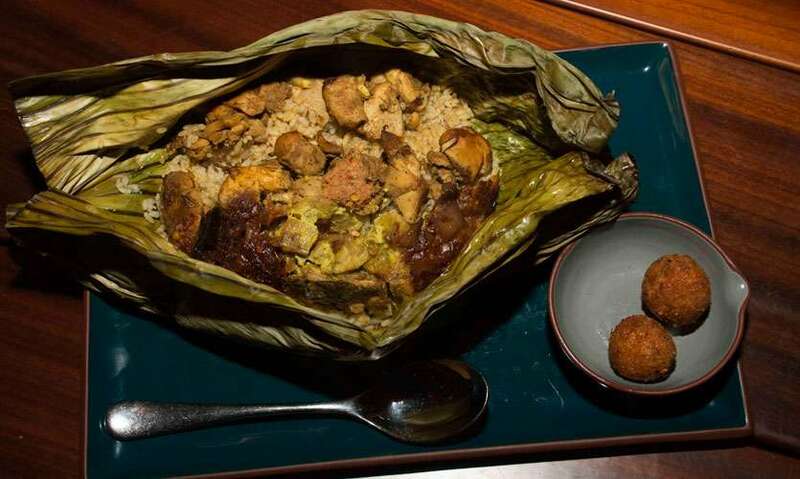 What makes the lamprais is the stock the rice is cooked in as they use different bones to create the stock and the flavours really come through. Available in either chicken or mixed meat, the lamprais comes with the usual accompaniments like the frikkadels, blachan (shrimp paste), brinjal pahe and ash plantain. Their Kottu Sutra is a spin on a local favourite made on a Japanese teppanyaki grill. Diners can choose their base of roti, string hoppers or egg whites and their meat as crab, prawn, Australian mutton, mixed meat, pork spare rib, barramundi or chicken. We had their Crab Kottu (Rs. 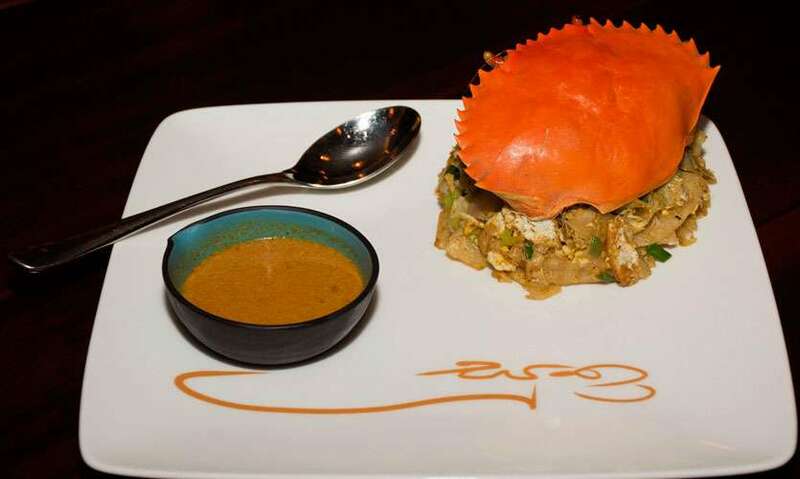 1800) which is served with crab curry and includes plenty of crab meat. 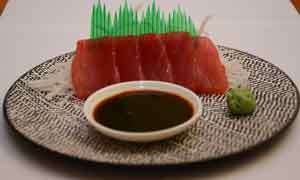 Their signature dish however is the Tuna Ambul Thiyal (Rs. 1600) which is somewhat of a theatrical affair because its made at your table in a matter of minutes. 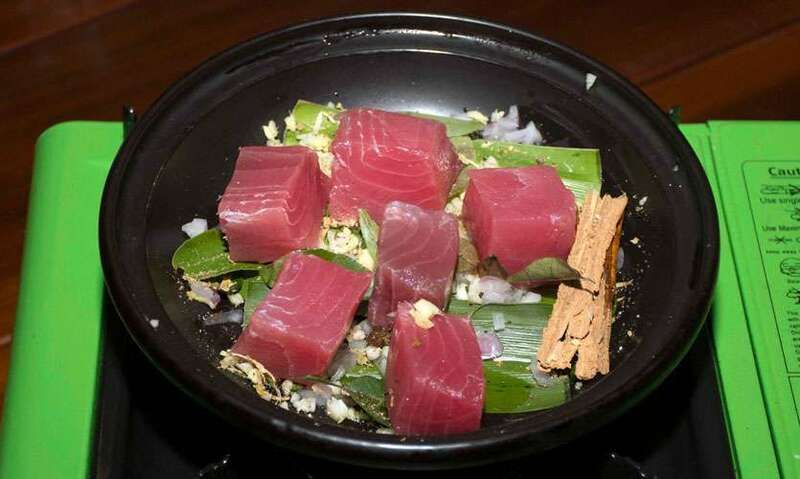 Sashimi grade tuna cut into cubes is bought to your table along with a cooker and spices and a server mixes black pepper, salt, water and tangy garcinia cambogia with the tuna and 8 minutes later your Ambul Thiyal curry is ready to eat! Just dip their famous hopper into the curry and enjoy a local dish that usually takes days to make. 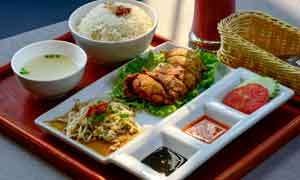 Overall dining at Kaema Sutra is always a treat and their new pleasure hour deal is one you shouldn’t miss out. Binoy’s quirky cocktails, Kaema Sutra’s twist on our local cuisine and a stunning view of the setting sun at the Shangri La Hotel, Colombo is the perfect way to wind down after a long day!